Scientologists espouse a philosophy of personal and spiritual growth, but the church's critics say it comes at too high a price. Jeremy Perkins didn't want to take his vitamins. He sometimes took the dozen or so his mother, Elli, set aside for him in the belief they would make the delusions and voices go away. On a cold morning in March 2003 in the Perkins family's white, two-story home on busy Hopkins Road in Amherst, Jeremy flushed the vitamins down the toilet. "I don't like to take (them) because I always feel better if I don't," the 28-year-old Perkins later told Amherst police. "I told her I didn't want to today." Perkins also didn't like his mother telling him to take a shower. He obeyed her, but when he finished, he told the police, he stabbed at his wrists with a utility knife. "I wouldn't die," he said, "so I decided to do my Mom in instead." Jeremy Perkins was a member of the Church of Scientology. The church's beliefs of spiritual enlightenment and self-improvement are based on the philosophical and psychological teachings of its late founder, science fiction writer L. Ron Hubbard. Because Jeremy and his mother shared the church's adamant opposition to psychiatry, he didn't take drugs that medical professionals say could have staved off his illness - and saved his mother's life. 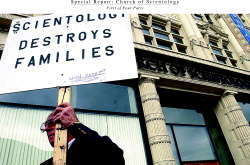 Scientology's anti-psychiatry stance is one reason the 51-year-old organization remains a source of worldwide controversy and, frequently, condemnation. It claims up to 8 million members in 154 countries, including about 500 members in Western New York. The church has received credit for its anti-drug and pro-literacy teachings. But it also has been criticized by governments, former members and cult experts who say the church is an authoritarian, moneymaking cult that can ruin people's lives. In November 2003, the Buffalo branch of the church moved into a renovated 19th century building north of the Theater District, heralding Buffalo's role as a Northeast hub of Scientology. In light of the global controversies and its growing presence in Western New York, The Buffalo News has examined church practices, looked at court records and interviewed more than 60 people, including Scientologists, attorneys, former members turned critics, medical professionals, city and county officials, and targets of Scientology lawsuits. And, as seen with the Perkins family, the Buffalo church - known internally as the "Buffalo org," for "organization" - opposes psychiatry. Elli Perkins' devoted opposition may have proven fatal. "Elli was adamant about not allowing psychotropic drugs," said Dawn Pastva of Kenmore, a longtime friend of the family. "She said it was against all the (Church of Scientology) tenets, and psychiatry was the equivalent of the devil." On the morning of March 13, 2003 - L. Ron Hubbard's birthday - Jeremy Perkins went into his family's kitchen, grabbed a 12-inch knife and hid it behind his back. In his delusional state, he was suspicious of his parents' decision to send him that afternoon to live for a while with someone in the Southern Tier. He thought the vitamin pills his mother wanted him to take were making him worse. And he believed his mother possessed an evil eye. Elli Perkins, a Scientologist for more than 30 years, was talking on the telephone when Jeremy pushed her into a bedroom. He stabbed her 77 times. Perkins was arrested that morning and held without bond. A grand jury indicted him three months later on second-degree murder and weapons charges. Scientology's anti-psychiatry position reaches back to the medical establishment's dismissal of Hubbard's 1950 book, "Dianetics: The Modern Science of Mental Health." That book laid the foundation for Scientology. "Books like this do harm by their grandiose promises to troubled persons, and by their oversimplification of human psychological problems," psychologist Rollo May wrote in the New York Times shortly after its publication. Hubbard believed the psychiatry profession was composed of "psychotic criminals" and was convinced it was behind criticisms leveled against Scientology. That view remains unchanged today among church leaders. "Psychiatry attacks us because they know our technology works," said Teresa Reger of East Aurora, president of the Buffalo church. "They are making billions of dollars on drugging people, electroshocking them, and basically maiming and harming them." The group's anti-psychiatry outlook extends to the emerging bioinformatics hub in the Buffalo Niagara Medical Campus, just blocks from the church. "I think (bioinformatics) is absolutely terrible," Reger said. "The drugging of America is the downfall of America, and that's what that represents." That view was prominent in a graphic exhibition at the Langston Hughes Institute, on High Street, in September, and one that briefly appeared last Monday in Old County Hall, both set up by a Scientology spinoff group. It warned that millions of children were being given "cocaine-like drugs" for behavioral and learning disorders. "Mental illness does not exist, just like God does not exist in my view," said Thomas Szasz, a Syracuse psychiatrist often touted by the church. "The public has a need for it to exist, because it gives them an easy way to deal with such things." The Perkins family practiced Scientology devotedly and was steeped in its anti-psychiatry beliefs. Donald Perkins, Jeremy's father, had been a staff member in the Buffalo church in the 1970s. Elli Perkins was an advanced Scientologist, and an upper-level "auditor," or spiritual counselor, and part-time staffer about to go full time. Jeremy's older sister, Danielle Carlson, is a high-level auditor, and her husband, Jeffrey Carlson, is the Buffalo org's executive director. Scientology's Reger said she didn't believe Scientology should be singled out as a religion because it rejects psychiatry. "The only thing our religion is trying to do is bring people together. We help people stay away from drugs, repair their marriages, and we teach kids how to read," Reger said. Jeremy Perkins had a friendly and easygoing, even timid demeanor. He was artistically inclined, like Elli, a glass painter who depicted scenes of plants and rural life. Perkins had learning problems that caused him to repeat the first grade. He later dropped out of Williamsville North High School. He enjoyed playing the drums, sometimes practicing with a couple of friends. Perkins installed siding for his father's business and was a good worker until late summer 2002, according to a defense attorney. Jeremy's declining performance had made him such a risk to his own safety that his father fired him. Most troubling to Donald Perkins was that he found his son not responding well to questions. Around the same time, Perkins was arrested at the University at Buffalo after scuffling with campus police. He blamed his presence on voices telling him to find "Diana, the Roman Goddess" in the school parking lot. Ron Epstein, a next-door neighbor and close friend, said Jeremy Perkins was taken to three hospitals in a short time span for psychiatric evaluation - Buffalo General Hospital, Erie County Medical Center and Millard Fillmore Suburban Hospital's emergency room. And a letter Danielle Perkins Carlson sent to The News Saturday claimed her brother had been given psychiatric evaluations on at least three different occasions. "My parents also took him to a neurologist who again said he was, "just off in his own little world and no danger to himself or others,' " she wrote. The letter failed to give any specific details, and she declined to be interviewed. John R. Nuchereno, Perkins' court-appointed attorney, said he was told that Perkins was taken to two local hospitals for CT scans. But he insisted the family, including Danielle, never told him of additional psychiatric care. "I only knew what the family and Jeremy provided me with, and what they provided me with was that he had no psychiatric evaluation or psychiatric treatment in the past," he said. Nuchereno also said the family continued to reject treatment with psychotropic drugs. In the eight months before the killing, Jeremy suffered hallucinations, imagined space aliens were pursuing him and thought he was rock singer Jim Morrison. The Perkinses thought Jeremy's erratic behavior may have been the result of a head injury suffered while working on his truck. Elli also wondered if her son could have been slipped a hallucinogenic drug at a club a week later. "They were trying to think of everything that wasn't a psychological problem," Pastva said. "As his behavior became bizarre, it was clear he needed psychiatric care," Nuchereno said. "That's when the vitamin therapy started." Elli Perkins sought help by contacting Dr. Conrad Maulfair Jr. of the holistic Maulfair Medical Center in Topton, Pa.
Maulfair, a Scientologist, requested a sample of Jeremy's hair to diagnose his condition. After a family visit, Maulfair said Perkins had a high level of arsenic and toxic metals, including titanium, in his system, and he recommended an expensive intravenous therapy, said Nuchereno. R.P. Singh, a forensic psychiatrist in Rochester, later examined Perkins on behalf of the court. "There is no science that supports any treatment that is based on hair samples," Singh said. Maulfair, through his wife, declined requests for an interview. Elli Perkins decided to prepare her own vitamin supplements, Nuchereno said, but they appeared to have little effect on Jeremy's decline. Ron Epstein, a next-door neighbor and close friend, Epstein, the neighbor, said the Perkins family made "hundreds" of phone calls in an effort to help their son. "They pursued every avenue open to them through their belief system," Epstein said. "Although they, as Scientologists, didn't agree with psychiatry, I think they had reached a point that alternative medicine wasn't working and were willing to go beyond that." Two days before Jeremy's attack, Elli Perkins called the church seeking help for him, said Anne-Marie Dunning, then the church's "ethics officer." She said Carlson, Jeremy's brother-in-law and the executive director, told her to tell Elli to keep him busy. Jeremy had been classified by the Buffalo church as a Potential Trouble Source Type III, Dunning said. Hubbard had stated that was a person who is "entirely psychotic" and for whom there was "no treatment of a mental nature." Reger at first denied to The Buffalo News that Perkins had ever been a Scientologist or taken Scientology classes. Later, she admitted he had been a member. In fact, Perkins had taken Scientology courses in Buffalo as late as 2002, according to Dunning. He signed a "billion-year contract" (the church believes in reincarnation and the contract is for future lives) to work for an elite branch of Scientology in Los Angeles in the late-1990s, Dunning said, although he appears not to have done so. Scientology's Source Magazine revealed he took a course in 1999 aboard the church's 500-passenger ship in the Caribbean Sea. And he, along with others of his immediate family, was also a lifetime member of the International Association of Scientologists, Dunning said. Scientology presents an unwaveringly shiny, upbeat public image, reinforced through its literature, videos and public presentations. Sunday's article on the Church of Scientology stated Elli Perkins' killing occurred after the opening of its new building in Buffalo. The killing occurred before. Elli Perkins' killing - coming just five months after the opening of the church's new building in Buffalo - threatened to puncture that image at a critical time. After Jeremy stabbed his mother, the church began covering trails that could link Jeremy Perkins to Scientology, according to Dunning and her husband. "This was a black eye they were afraid of," said Rich Dunning, Anne-Marie's husband and the deputy executive director before the couple left Scientology in May 2003. There were other concerns. Elli Perkins was classified in the church as an "Operating Thetan," meaning she was an upper-level Scientologist. Bad things, let alone grisly murders, aren't supposed to happen to them, Anne-Marie Dunning said. "They're afraid it will show OTs are not any different than anyone else, and that's what they're selling," she said. "If she has her salvation, why would she be brutally murdered by her son?" "They told us, "Don't say anything, we will handle this. It's a job for the higher-ups,' " Rich Dunning recalled. That included leaving out any reference to Scientology in Elli Perkins' obituary, although memorial donations were solicited for the Church of Scientology in a paid death notice. If Scientology officials did their best to distance the church from Perkins, the judicial system put it in the public record. Court-ordered expert testimony during Jeremy Perkins' appearance in Erie County Court suggested his rejection of modern psychiatric care contributed to his worsened mental state and possibly the tragedy that followed. Jeremy Perkins was initially diagnosed as a "chronic paranoid schizophrenic" in court-ordered psychiatric examinations and treated with psychiatric medicine. "The onset of a schizophrenic illness was not dealt with in an appropriate manner," psychologist Joseph Liebergall concluded in April 2003. "It is unclear how long this illness has been active, but no definitive treatment has been afforded to this man." Singh, the forensic psychiatrist, went further. He testified in court in January 2004 that, had Perkins been treated with proper psychiatric care, "his mother would be alive today." That was the crux of Nuchereno's defense. "Jeremy was a young man who had never harmed a fly in his life," the defense attorney said. "Had he obtained competent psychiatric care, he would not have been in the predicament he found himself." Perkins was found mentally not responsible for his actions and is confined to Rochester Psychiatric Center. Pastva, Elli Perkins' friend, has wondered if things would have turned out differently with psychiatric intervention. "Amongst our group of friends, we would try to go around Scientology by equating what was going on with Jeremy with being a physiological problem," she said. "The joke was we really couldn't get what Scientology was about. But we loved Elli - she was such a beautiful soul - and after all, we'd say, "it was her religion and it wasn't like it was going to kill her.' "
The Buffalo church's Reger expressed sorrow over the tragedy but said the church's stance against psychiatry should not be blamed, noting that people on psychiatric drugs have committed murders. Perkins' sister, Danielle, in her letter to The News said: "My brother has been confined to the hands of psychiatry for the past two years. They have tried every psychotropic drug available to "help' him to no avail." Perkins, like many Scientologists, had a page on the Internet with a brief biography. The page - which appeared six years ago - was removed by the church shortly after Elli's death. The biography said he enjoyed playing drums, was a lifelong Scientologist, and would have wound up in more trouble if his parents hadn't been Scientologists. "Scientology has helped me be more in control of my life," Perkins concluded. "Scientology has also shown me what lies ahead for the future." Today: Anti-psychiatry beliefs of Scientology and how a follower descended into madness. Monday: How the Church of Scientology operates in Buffalo through the eyes of a couple who was with the Buffalo church for 18 months. Tuesday: How local political leaders have supported efforts of the Church of Scientology, and professionals question the anti-drug treatments prescribed by the church. Wednesday: The high cost of Scientology to individuals who are urged to break from their families and give money to the church. The Church of Scientology in Buffalo moved into a renovated building on Main Street in 2003 and declared the city a Northeast hub for the faith. In September 2004, retiree Frank Green protested against the church, saying it had alienated his family from his niece, a Scientologist.